There’s nothing like getting a brand new baseball glove. 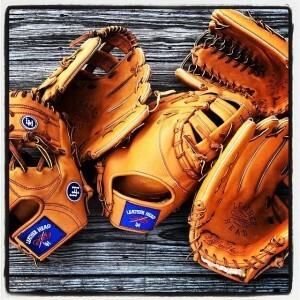 That first time you put it on your hand and smell the new leather is memorable. Getting a stiff new glove into game condition can be a daunting task. 1 – Don’t stick it in the oven or a microwave. The laces dry out and shatter. Trust me on this – I’ve relaced three brand new gloves that had laces damaged by customers who in effect baked their glove. 2 – Don’t drive your car over it. Think about this – you just spent a decent amount of money on a quality glove and now you want to run a 2,000 pound vehicle over it? Save the gas…and the leather. 3 – Don’t cover it with oil. Sure, oil softens the leather up and makes it more pliable. Oil also sits in the glove making it a bit heavier. In addition, it can soak into the padding of the palm. And eventually, oil will start to break down the leather. 1 – Play catch with it. By far, this is the absolute best way to break in a glove. It will form exactly to the shape of YOUR hand and in time will become exactly the way you want it. 2 – It’s OK to use a mallet to pound the pocket of a glove, especially a catcher’s mitt. That will help soften the leather a bit. Just don’t over-do it. 3 – Use a lanolin-based cream in moderation. I generally recommend putting it in the pocket; some will put it on the outside of the fingers, too. Unlike oil, lanolin-based creams don’t soak into the leather and don’t make the glove heavy. Professional Baseball Instruction has a couple of these creams in stock in our pro shop including Gloveolium (a fine Rawlings product). I’ve also used shaving cream with a lanolin base. 4 – Put a ball in it and tie the glove closed and/or put it between a mattress and bed spring. 5 – See #1. Play catch with it. If you have any questions, please feel free to contact Jim Monaghan here at PBI.